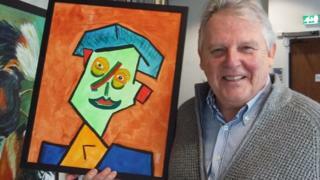 A man who took up painting after suffering a stroke said it has "changed his life". Tony Wates, 69, from Southend, Essex, suffered partial sight loss after the health scare in 2014 and turned to art as a comfort during his recovery. He said: "I could have died and I just had the urge to paint, to leave something behind. A record of my life." He held the first exhibition of his work last month and sold some portraits for the first time, for up to £500. But he said: "It's not about the money. I just want to impress and it's a wonderful feeling when someone says they like your work. "Because I'm dyslexic, I didn't get praise for much at school, except for art, but I hadn't done any kind of artwork for more than 50 years." The month-long exhibition, which ran at The Forum gallery in Southend, featured about 50 of his paintings. "The great feedback from people was a real confidence boost and made me think 'I've arrived' and made me definitely wanted to put my work on show," he said. One of his first subjects was his son - a soldier who was on tour in Afghanistan. "I found it comforting to paint pictures of him while he was away. I felt closer to him," he said. "I don't think I would have got into painting had I not had a stroke. "A health scare makes you think about your mortality and focuses your mind. It's changed my life."